Some examples [frescoes] of Piedras Negras, Guatemala, show a knife with knots of paper and a feathered plume of the sacrificial victim, with his heart possibly extracted, leaning over a bundle of paper for a burnt-offering. The reduced size of the characters raises the possibility of youngsters or infants, whose breasts are opened more easily by its cartilaginous nature. There is a series of images on plates with infants whose breasts show a small cut on the heart (e.g., the famous dish of the Popol Vuh, K3395). But not all of them are representations. In 1985, as a member of Project Caracol in Belize, Stephen Houston excavated a reused crypt with at least twenty-five individuals, where he found the body of a newborn on top of a plate. Incidentally, it is remarkable the presence of fire in scenes of children, such as in a mural of a jamb of Tohcok, Campeche, and another on Stela 3 of Yaxhá, Guatemala. The first image traces the shape of a body on an incendiary base, bundles of firewood with ajaw on the head, corresponding to the sign of the homes of the founders of dynasties, especially those related to the pre-eminent city of Teotihuacan. The second image shows the remains of a human body on a plate supported by cross-shaped sticks. From above fall grains of incense, ch’aaj in the ch’olan language in most classical texts; from below clouds of fire raise up. Through the sign for “wood,” té, inscribed next to the trait, it is indicated that the dish will also burn. A documented vase (K1645, above) by Justin Kerr explains the mythical context of these historical facts. Two supplicant characters, the first perhaps tied as a captive (at least placed in a very uncomfortable position), faces two “packages” with heads of gods, a scene that appears in other vessels, but with different dates and other companions. The verb “born” sihyaj suggests that Chahk, the rain god, and the so-called god of “Pax” are newborns. In the vase K1645 the supplicants are ch’ajoomtaak, “those who spread incense.” The first character carries the attributes of the ch’ajoom, “incense spreader,” even a distinctive headband and a dress of dry leaves. Both supplicants offer to the enthroned figures an object named “his foot,” yook, perhaps referring to the wooden scaffolding that stands in the stela of Yaxhá. The link to the fires is made clear with the presence of the inflammatory base behind the scaffold. Unlike other sacrificed children, the infant appears to be alive [Chechar’s note: see image below]. 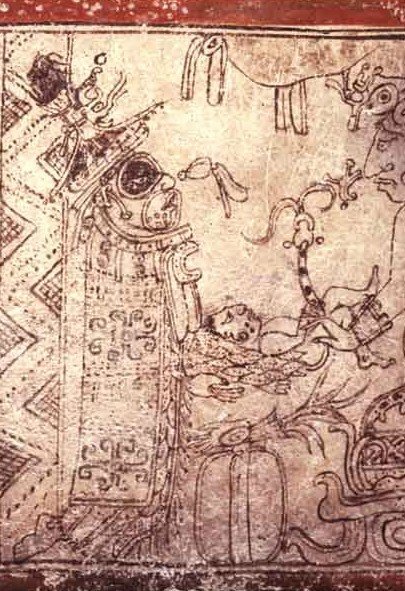 The presence of infants over the plates, especially in contexts of way [Mayan word] or co-essences of Maya rulers, indicates that this is a special “food.” Usually, the way was very different food from the food of human beings, with emphasis on hands, eyes, bones, and in this case, the soft bodies of children. The presence of women and children indicates that these individuals were not enemy combatants and strongly suggests a sacrificial context, though perhaps a sacrifice of wider political significance. Several skulls of Colhá show marks of sharp and unhealed cuts, particularly around the eye sockets, which suggests that some of these individuals were flayed, either shortly before or after death. The skinning of the face supports the iconographic images of beheading showing substantial mutilation, particularly of the eyes. Although it is likely that much of this occurred post-mortem, we must ask whether at least some of these traumas were inflicted before death to maximize the suffering of those about to be executed. Note: For my psychological interpretation of Maya and other Amerind cruelty, see The Return of Quetzalcoatl, a chapter of my book. I read The Return of Quetzalcoatl as linked above and it was the most novel thing I’ve read in a few years. The idea that ancient societies were bicameral/schizoid and failed to make the psycho-genetic leap when faced by “modern” invaders is huge. Although what i’ve seen of pure South Amerindian populations they still aren’t “modern” even though they have some western goods.